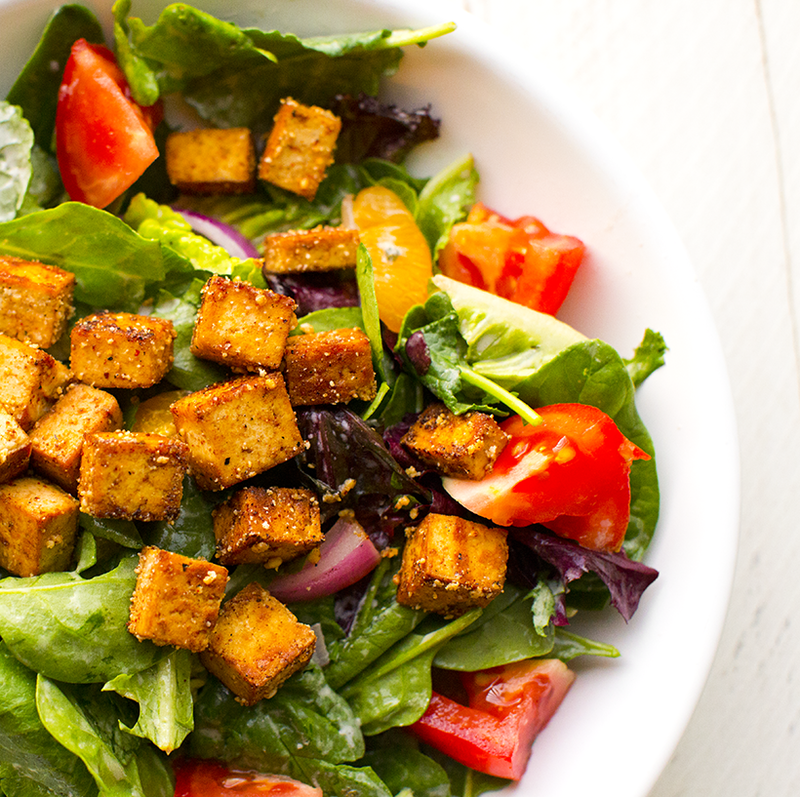 These simple and tasty Tofu Croutons are perfect for adding a punch of protein to your salad or soup. They have a mild cheezy, peppery flavor and golden edges all around. Infuse some serious flavor into your tofu, and fall in love with it all over again! The most important ingredients in this recipe? The seasoning! The truth is, you could use any combo of spices and flavorings you’d like, but I really loved the combo of black pepper and Parmesan cheese. I also added in some cayenne and smoky paprika for a hint of heat. Adding in a small touch of sweetener is a good idea for caramelization of the tofu edges and to help tone and sharpen the savory flavors. As usual, salt these cuties to taste. You can easily whip these up in a few minutes. * Add an extra layer of vegan Parm and make a Vegan Caesar Salad! These cheezy, peppery, crispy-edged cubes of tofu could totally pass as salad croutons. But instead of bread, they are packed with protein. Easy to whip up in minutes. 2-3 tsp extra virgin olive oil for pan. Dice your tofu into small cubes. Set tofu aside. Warm a skillet over high heat. Add the oil. When oil is nice and hot, reduce heat to low and add in the tofu. Your tofu should immediately sizzle and brown on the edges from the very hot oil. Shake the pan and toss the tofu a bit. When the sizzling dies down you can turn the heat back up to high. When the tofu is looking nice and browned on all edges and sides, turn the heat back to low and add in the maple syrup. This will sizzle the pan nicely again. Shake the tofu in the pan to evenly distribute the maple. Now sprinkle over top the tofu: salt, pepper, paprika or cayenne and vegan Parm. Shake the pan again. Allow to cook for one more minute, just to warm and toast up the Parm and spices. Taste one cube and add more spice + salt + Parm to taste, if needed. Remove from heat and allow croutons to cool for a minute before adding to salads, soups or nibbling on their own. Prep Time: 00 hrs. 04 mins.